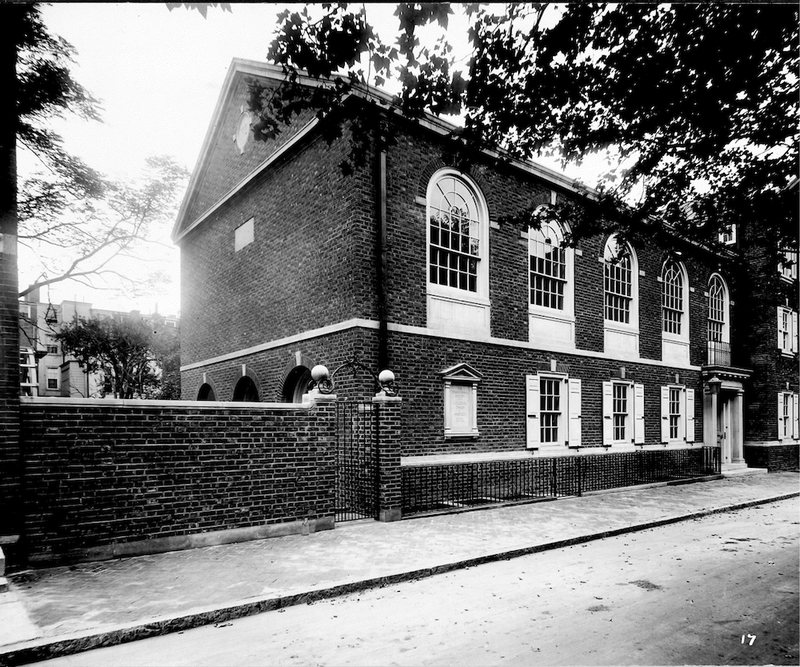 One the nation’s longest-standing advocates for historic preservation, The National Society of The Colonial Dames of America in the Commonwealth of Pennsylvania, occupies a century-old clubhouse on Latimer Street near Rittenhouse Square. About 500 women belong to NSCDA/PA and every one of them is a descendant of someone who served the American colonies in a patriotic capacity prior to July 5, 1776. The group adds about 25 new “Dames” each year (a member must show genealogical proof of their ancestor’s patriotic service). The clubhouse at 1630 Latimer Street, designed by architectural firm Ritter & Shay in the early 1900s, is unusual given the Dames’ commitment to historic preservation. Traditionally, the organization seldomly commissions the construction of a new building; the Dames are second only to the National Park Service in their stewardship of historic buildings nationwide. The NSCDA supports and preserves over 80 historic museum properties across the country. In the state of Pennsylvania, the Dames are responsible for the preservation and administration of Stenton (the c. 1730 house of Pennsylvania Colonial Secretary James Logan in Nicetown) and Woodville (the late 18th century home of John and Presley Neville in southwestern PA). The Dames are a leading partner in the Historic Germantown consortium and assisted with the restoration of Congress Hall in the Independence Hall complex in the 1890s. The Dames sponsored the construction of a replica of Sulgrave Manor (the ancestral home of the Washington family in England), also executed by architects Ritter & Shay for the Sesquicentennial International Exposition of 1926. 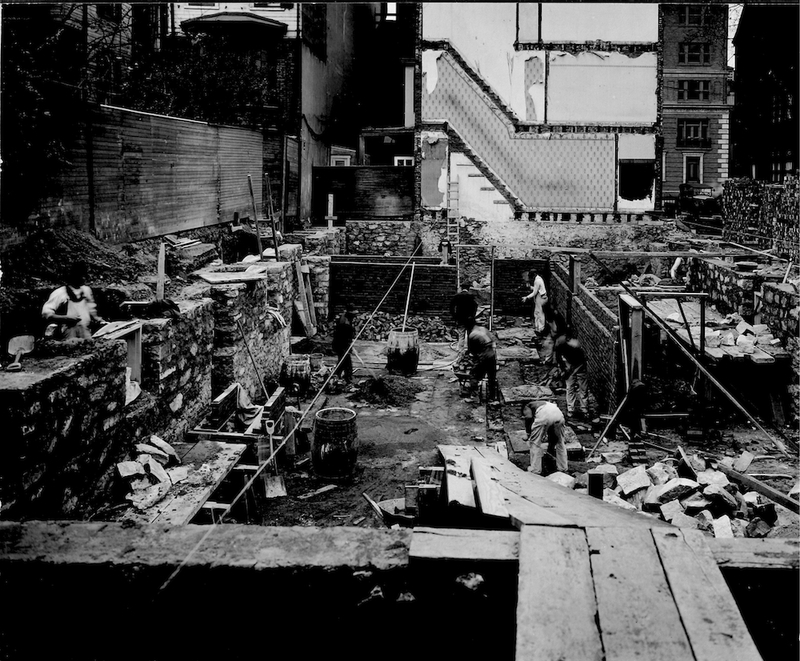 Photographs show construction of Pennsylvania’s Colonial Dames’ headquarters on Latimer Street, from beginning to finish, in the 1920s. Images courtesy of The National Society of The Colonial Dames of America in the Commonwealth of Pennsylvania. 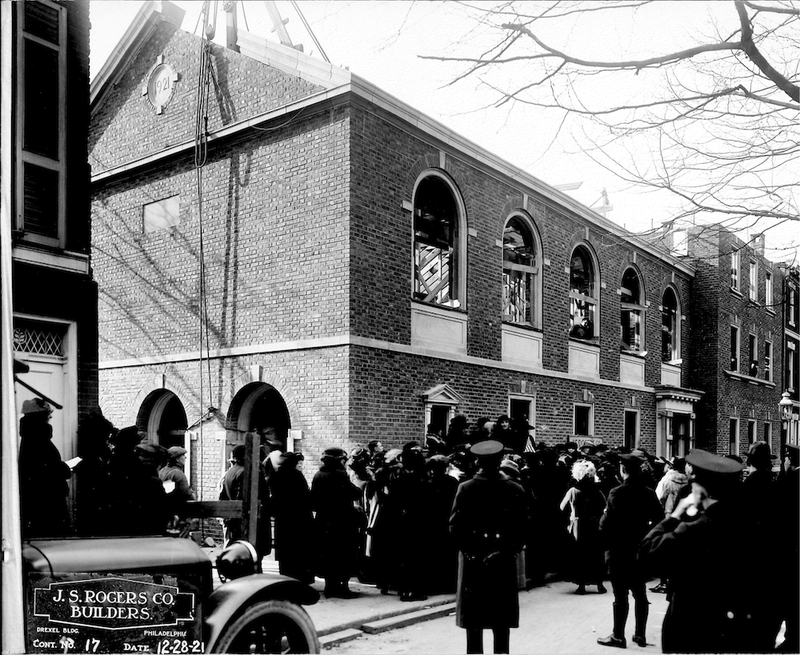 Prior to the construction of its formal headquarters on Latimer Street in 1921, early meetings of the NSCDA/PA were held in members’ homes. The founding of the organization itself, on April 8, 1891, took place at the home of Fanny Hollingsworth Arnold at 1301 Locust Street. The Pennsylvania Dames are considered the “founding society” of what now constitutes the NSCDA–an unincorporated association of 44 societies with some 15,000 members nationwide. When the Dames acquired Stenton in 1899, they used the Logan family’s colonial residence as a meeting venue. As there was (and still is) no central heat or electricity in the house, an old coal stove was placed in the rear dining room to provide heat for club gatherings. The preservation of Stenton as a “historic object lesson” has constituted the NSCDA/PA’s largest project in the 125 years since its founding. The Dames are still the principal administrators of Stenton and continue to support and array of research projects and educational initiatives there. 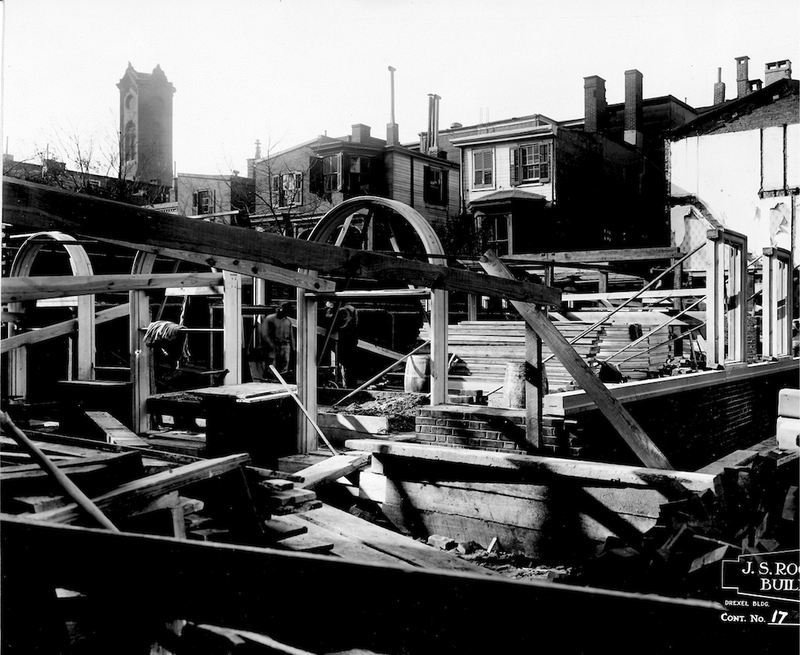 Several row houses were demolished in order to make way for the Dames’ new headquarters. Ritter & Shay employed a general Pennsylvania Colonial style in the design, but did note that the design of second floor Meeting Room pays homage to the interior of Old St. Peter’s Church at 313 Pine Street. “The closest element to an architectural ‘quote’ is a pilaster and column screen between the reception room and the staircase, similar to, but not copied from Cliveden,” says Laura Keim, curator at Stenton. Mary Johnson Brown Chew, a descendent of Benjamin Chew who originally built Cliveden in Germantown, was an influential Dame at the time the headquarters were being designed and may have had some say in the inclusion of this detail. Shortly after the original clubhouse was completed, the Dames purchased the adjacent lawn space around 1927 and gardens were laid out by Philadelphia landscape designers Emily Exley and Frances Kite. The garden sits on land once owned by Colonel John Richard Latimer, the man who plotted the street in 1835 (and for whom it is named). The site was part of Latimer’s farm and pear orchard. Additional garden space in the back–referred to by the Dames as the “secret garden” because it is not visible from Latimer Street–was purchased in the 1940s and designed by Marian Cruger Coffin, one of the first female landscape architects in the United States, who also planned the gardens at Winterthur. Coffin was approached to develop a few schemes for the space by her friend and active Dame, Frances Morgan. Since the secret garden was being conceived during World War II, when money and resources were tight, creative plans were proposed like working with the existing orchard and using plants from Morgan’s own garden. The Dames ultimately decided to move forward with Coffin’s Colonial Revival knot pattern garden with interlocking circles, a low maintenance design that suited the character of the clubhouse. The Dames added an additional townhouse to the headquarters in the 1950s, which is seamlessly connected to the original structure. The addition includes a library designed by G. Edwin Brumbaugh, a Colonial Revival and restoration architect and husband of Dame Frances Brumbaugh. Edwin was also involved in overseeing the rebuilding of the chimneys at Stenton, as the Dames often hired professionals from their own social networks and had them work on both Stenton and their headquarters on Latimer Street. Architect Walter Cope, of Cope & Stewardson, a Logan descendent who helped prepare Stenton before it was opened to the public, was the cousin of several active Dames. A delightful piece! Thank you! What a great write up. Hope generations to come enjoy and cherish these buildings and the history they have seen. I had my wedding there, its a great place. Thanks for the article.